I’ve been a runner before, but I never had any goals to get faster. I treated running like a calorie burner and just went out to go through the motions and enjoy the freedom that comes with running. I’d lock in around a 10:00 pace and was happy with that – and I could run for as long as I was told to run at that pace. I ran some 20K’s, 15K’s, a half, 7-mile cross countries, and heaps of 5K’s and 10K’s while operating a running club of almost 100 people. It was fun, it passed the time, and it kept me healthy. It was good. This time around, things have been markedly different. Since early February, I’ve been running at least 3 days a week. In March, I ramped that up to 4-5 days a week, and by April 1st, I was up to a solid 5 days a week. From April through now, I’ve been in a constant cycle of training for aggressive races and personal challenges using real training plans with tempo runs, intervals, hill training, and distance runs. I’ve really enjoyed the different challenges, and shifting my focus from distance to time blocks has made all the difference for me. Instead of running X miles each day, I’ve focused on running FASTER and HARDER in X amount of time. You know – real training! Looking back on my first big race of the season on April 30th, I chuckle at my excitement over my pace. I mean – 9:30 was GREAT back then but it’s nothing compared to now. That rigorous training plan got me out of my 10:00 pace rut and I’ll forever be glad that I tried that plan (and kept doing it for each race). Going from an average long distance pace of 10:30 years ago when I was in decent shape to 9:30 this year is a huge improvement and proves the importance of real training. The next race was a 75-mile relay, something I’d never done before, on May 7th. I was a fill-in for the race and was worried I’d be the slowest on the team, especially coming off of the half the weekend before and that fast 5K just a few nights earlier. I ended up being the first or second fastest on the team out of 8 runners (we didn’t compare official times but there was a big difference between the two of us and the others) and my two sections of the race were run in the 8:20’s range. My first leg was 5.7 miles with a 8:26 pace and my second leg was 4.3 miles with a 8:23 pace – I was definitely happy with my contribution to the team. On June 4th, I ran my second half marathon of the season and PR’d/PB’d it with a finishing time under 2 hours. 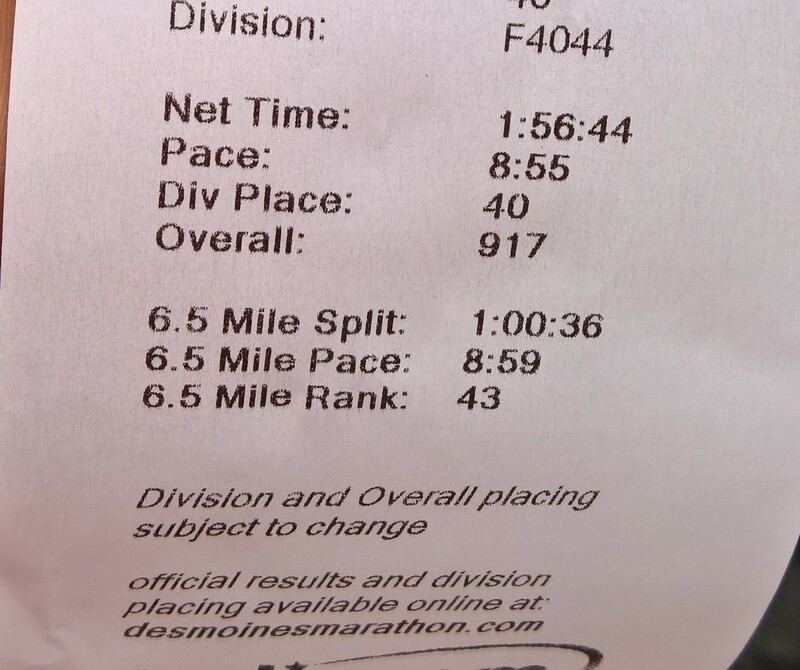 I was shooting to beat my first half marathon pace by 10-20 seconds, but shaved off 26 seconds per mile. Of course, coming in so close to being under a 9:00 average pace haunted me the rest of the summer… I should have (and could have) run faster. July 23rd brought my third half marathon for the year and it was run 5,000 feet higher than where I live, so I was targeting a very slow pace for myself. I targeted a 2:10:00 finish but came in just under 2:06:00 which made me happy. Being in the mountains added 32 seconds to my half marathon PR/PB pace from the month before but only 6 seconds to my starting half marathon pace at the end of April. Another “win” for me, but it was tough having a non-PR race so late in the season… being perfectly honest. On September 21st, I ran a 10-mile race I’ve wanted to run since I started running 10 years ago. I took a quick look at the route but didn’t concern myself with elevation. I’d tapered back my training a bit and was slipping into a routine of running for distance goals again versus time block goals, which was what I really needed to be doing at the time. I was feeling a little burned out. 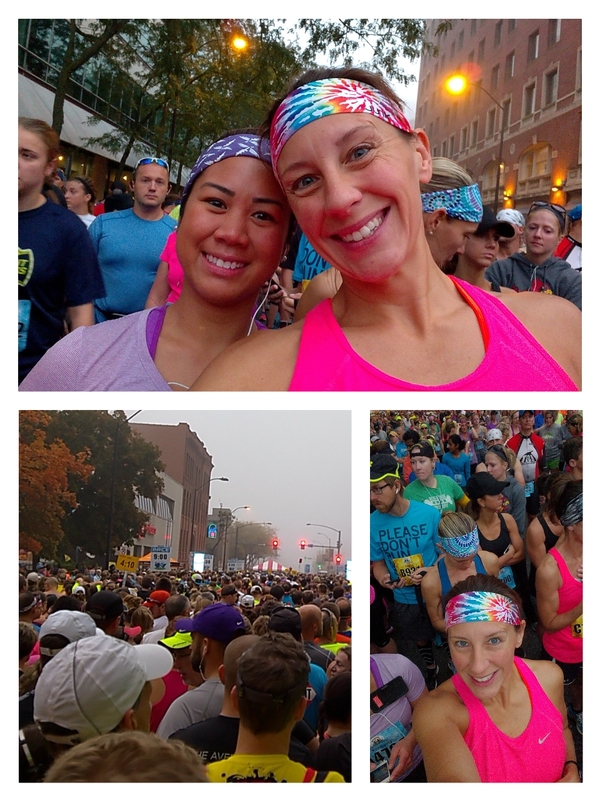 The morning of the race, I had no expectations other than coming in under a 9:00 average pace. I came in with a 8:37 average pace, the best long distance pace I’ve ever had, and likely ever will have. And now finally, I’ve finished my last half of the year with yet another PR/PB which was not what I expected. My pace was slower than the 10-mile race, but for half marathons, I set another PR/PB for myself that will probably be my PR/PB for the rest of my life. I know I shouldn’t sell myself short that way, but I expect this one to be the one that sticks. Coming in at a 8:55 pace for 13.1 miles is something I never thought would happen and I’m super proud of it… and stunned. What is really a HUGE improvement for me is that each of these long races (half marathons and the 10-mile race) was a “negative split” race, meaning that the second half of the race was run faster than the first half. To improve my pace in the second half of a race is something that I’ve worked hard at doing, and I do think that the training schedule I used contributed to that. I will for sure use the same training plan hfor distance running in the future, but I don’t plan on running this many races next year. I’m still deciding if I’m going to run a 10K on November 5th or not – I feel like I need to have an official 10K race this year for record-keeping. We shall see. For distance, though, I am done. I’m thrilled to end on a high note with a half marathon PR/PB in the 8’s! 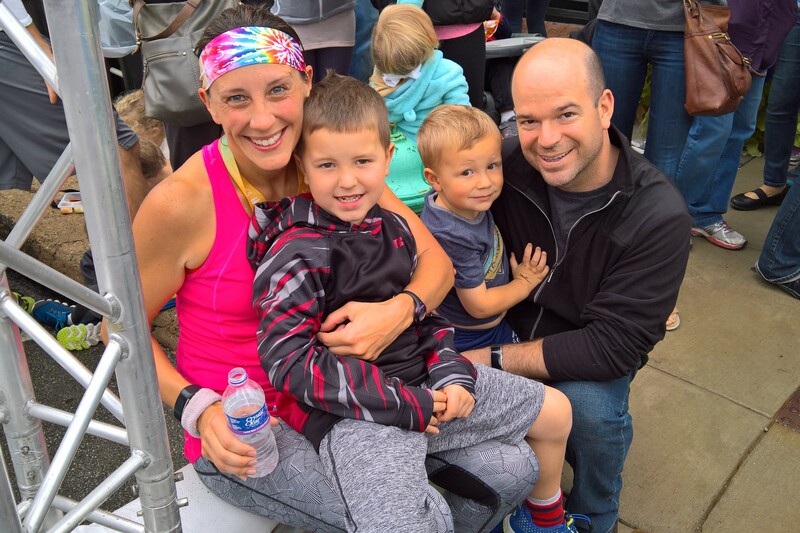 Below is a summary of my significant races this year – there were some other 5K’s but they weren’t serious and I was always pushing a stroller or double stroller with heavy kids. Ha! So excited to be in the top half of all women runners!!!!! I’ll never beat this 5K time – I have no idea how I could! Rankings were insane – so excited! Loved this – will want to do it again! 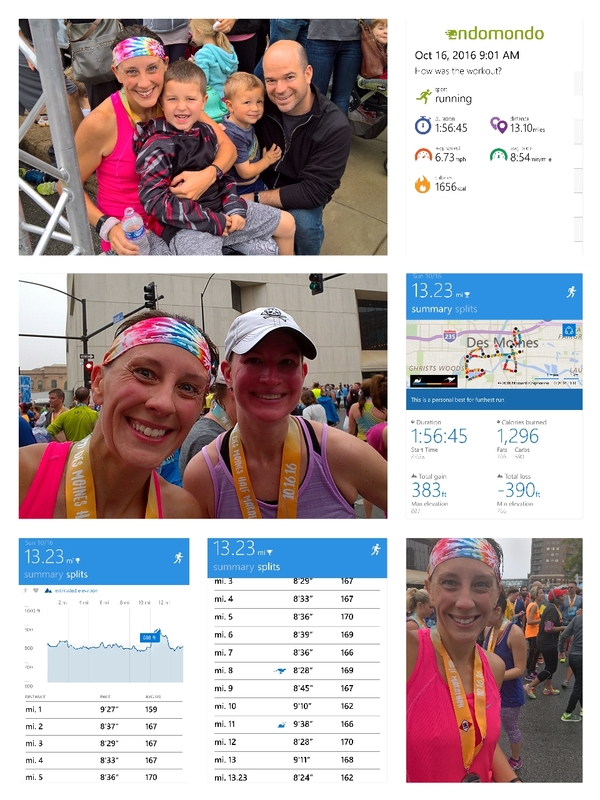 Top 17% of women and division is awesome for this race – did not expect that! Could not be happier with the pace! Females in my age division are damn fast! I think I’ll do this one again next year – I really enjoyed it! I ran my final half marathon of the season yesterday. I tend to sign up for “just one more” long distance race upon finishing a big race – racing is addictive. But at mile 9 yesterday, as I was tracking to set another PR/PB, I told myself, “this is it – no more this year.” It felt good to say it. It felt good to repeat it to myself. The decision was made. This half was a real struggle, probably because I was running pretty fast (for me). The first mile was slow due to the sheer number of runners (6,000+), but miles 2+ picked up pace and I was decreasing my average pace every mile. The course was pretty flat and wide, so it was easy to set your own pace and go. I passed the 2:00:00 pacer in mile 4 so I knew I’d come in under 2 hours (the pacers will bring their group in a couple/few minutes before target time). I was tracking a solid 8:50 pace for MILES, and as I told my friend, once I get to mile 8 or 9, it’s downhill from there. There was a NASTY hill at mile 11 (see elevation map) and I did what I never do…. I walked. I ALWAYS walk the water stops but besides those, I do.not.walk. But I had to. And I walked a few times between miles 11 and 12.6. Yes, I walked in the final mile. I was BEAT. I wasn’t sure where my husband and kids would be, so I felt shamed while walking and would never walk for long – I didn’t want my kids to see me walking! At 12.6 miles, I told myself I needed to run for, “no more than 5 minutes” and I’d be done. So…. That’s what I did. 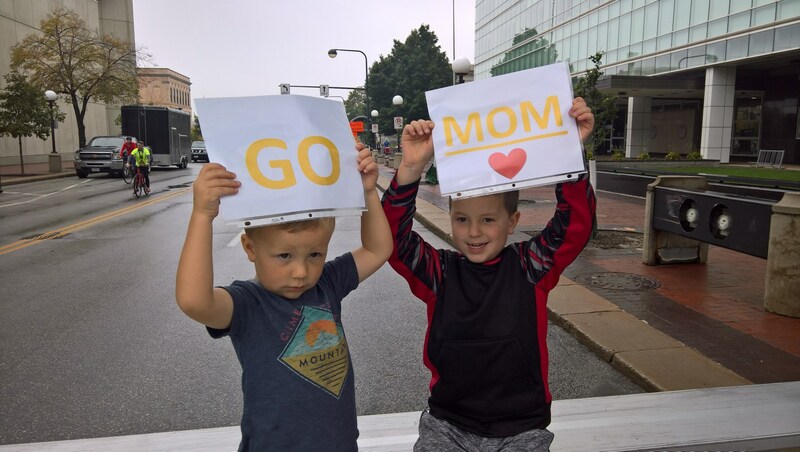 The BEST part of this race is that my kids and husband watched me cross the finish, which hasn’t happened all year for my distance races because of complexity in getting there. I didn’t see them, but they saw me (I’m told I was hobbling in at the finish – I believe it! )… And that makes me happy!